You sure do get a bad rap, don’t you? Too tough… too fat… too dry… too thick. No wonder you have body image issues. I would too. Well, I’m here to bring a little light… err, I guess I should say moisture… back into your life. I really can’t call throwing you in a scorching cast iron skillet and watching you fry until you become a beautiful, crispy golden brown color “light,” now can I? I know you have probably felt like the red-headed stepchild in this relationship of ours considering I give so much attention to the main meat in my life – bacon. I can’t say I will apologize for that; bacon and I have a good thing going. However, I’m here to share a little more love with you and hopefully spice you up a bit so others will stop talking trash. Sound good? First, you’re gonna take a nice long bath in a big pool of buttermilk. Now calm down. Buttermilk is good, don’t be scared. It might be a little cold though, sitting in that fridge all night. I’ll make sure to leave the light on since I know what it’s like to be afraid of the dark. After that, I’m gonna wrap you up in some delightfully crunchy panko breadcrumbs and parmesan cheese. This whole panko thing? It is kind of new in our world, but I think you’ll like it. Much better than regular breadcrumbs. And you should feel comforted considering I’m pairing you up with one of my closest friends that has always helped me in times of distress: cheese. I think you’ll get along great. The next part is where things get dicey. I don’t really want to go into detail about where you’re going to end up, but let’s just say it will be slightly unpleasant. Especially once Mr. How Sweet finds you. But I ensure you that you’ll be found in good hands. See you on the other side! Tenderize and trim fat from pork chops if you’d like. It’s not necessary but I do it. Add pork chops to a baking dish and pour buttermilk over top. Soak for at least 2 ours, or over night. Remove pork chops from fridge 30 minutes before you plan to make them. In a bowl, combine panko, flour, salt, pepper and parmesan. Heat an over-safe skillet on medium-high heat and add olive oil. Grab a pork chop from the buttermilk, letting any excess milk run off. Dredge through panko mixture, coating completely. Lay down in skillet and repeat with remaining chops. Brown pork chops for 3 minutes on each side only! You don’t want them to toughen up. After six minutes, turn off heat and add chicken stock to pan. 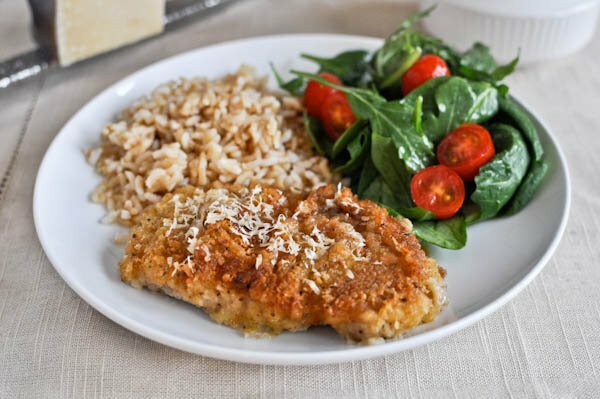 Sprinkle a little parmesan on pork chops and cover skillet. Bake for 20 minutes. P.S. Sorry my stove was so dirty. If I knew that this would be your last hurrah, I would have been a bit more diligent in my daily yearly cleaning. Made these exactlty as the recipe described and they were tough and soggy!